There is very little in a home that can give the homeowner or renter as much pride as a hardwood floor. The expanse of the grain giving wood its rich and lustrous appearance cannot be matched by any other floor surface. It is very durable and, with proper care, should last, unlike carpeting, the lifetime of the house. Proper care of hardwood includes a proper cleaning that should be accomplished as frequently (weekly is best) as carpeting, tile, and other flooring. Fortunately, a hardwood floor, while more expensive than another flooring, is easier to maintain as long as the maintenance includes dedicated cleaning. Frequent cleaning of a hardwood floor is best accomplished with a dust mop or a vacuum cleaner, unless there has been a spill. Any spill should be cleaned up immediately to avoid spoiling the wood finish. This article will concentrate on the best canister vacuum for hardwood floors – reviews and buying tips without spending arms and legs since they have probably already been spent on the floor itself! ==>> check out this model from Miele. 7-year warranty (motor and casing); 1-year for other parts! After you decided what type of vacuum you’re looking for, you should look for features that indicate the vacuum can be used for cleaning your old hardwood floor. There are several considerations when you want to get a reliable hard floor vacuum including the canister models. One of these features to look for is a switch which can control or stop the roller from spinning. Next, suction control is also useful, as this will help with reducing airflow when you only need some light suction. Another important consideration is the suction power. The more powerful the suction, the easier it can pick up the most stubborn of messes, including pet hair and dust. You will want to be sure nothing is left behind for a cleaner floor. Even better, a canister vacuum with bare floor setting or manual height adjustment will allow you to lower the power head when you vacuum your flooring (depending on the model you get, it may lower automatically). This function means it is a versatile vacuum that you will get your money’s worth out of. Vacuums made for carpets usually have hard bristles that are heavy duty in order to really get the dirt that are embedded in the fibers of the carpet. These same heavy duty bristles can do a lot of damage on your hardwood floor, making it so that it will need to be resurfaced. Resurfacing a hardwood floor can be very expensive; an expense that can easily be avoided by purchasing a vacuum (including canister) that is designed to be used on a hardwood floor. Also, if you look at the head of the vacuum, the beater brush is the thick bristled rotating cylinder located there. This will tear up the surface of your hardwood floor. This means this should be avoided at all costs; otherwise you will likely ruin your wood floor. You may like to know: How to vacuum your hardwood floors efficiently? Hardwood floor vacuums also have felt strips or rubber strips that were meant for helping protect the surface of your hardwood floor. 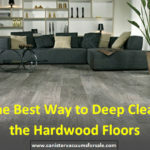 You will want to be sure that your vacuum has very powerful suction in order to get a good clean on your hardwood floor. This will ensure that all the stubborn dirt and pet hair comes up, which will give you a much cleaner floor. 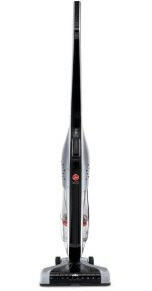 You will also want a vacuum that is lightweight and easy to maneuver around. This is preferable because you will want the freedom to be able to move around as needed, but also because with a lightweight vacuum, you will be less likely to scratch up the floor when using it. The weight of the vacuum can make a difference in how easy it is to move around the floor, and will determine whether or not scratches and scuffs will be left on the floor as a result of vacuuming. A heavier, full-size canister model is likely to leave scratches along your floor, due to the weight on the wheels as it rolls around your floor. This is another mostly preferred choice you will have to make. Some people like the ease of just emptying a dust cup and cleaning it out. However, dust cups generally hold a bit less of dirt and debris than bagged options. Bagged vacuums are not always ideal as sometimes it can be a messy undertaking replacing them. They are also costly to purchase additional bags. However, the bagged cleaners also have their advantages as explain here. As you know, some cleaners come with several attachments for your cleaning needs. The cleaner with upholstery and crevice tools is especially good for hard floors. If you have pets at home, a rubberized pet hair can have many advantages. Also, an edge cleaner may be a pretty convenient option to go with. If you choose a model that has this feature, it will be very effective at picking up dirt under the entire power head. As a result, it’ll clean right up to where the floor meets the wall. This is another important consideration especially for those with a limited budget. 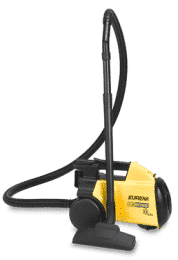 An affordable price canister vacuum always a preferred choice especially if the cleaner is designed for hard floors. See our recommendations below. We all care a lot about our hardwood flooring, and that is why we need to make sure we protect it as best as possible by regularly cleaning it. 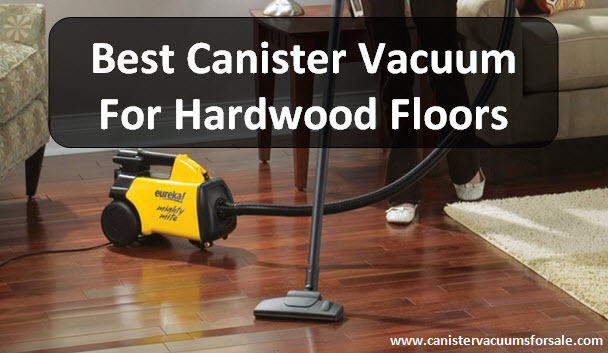 Now that you know the features of a canister vacuum for hardwood floors you may consider, all that’s left to do is decide on the model that suits your needs best. We tested and reviewed three of the best canister vacuums for your wood floors and carpets cleaning needs and below are our comparison results and reviews. *Note: Do not have HEPA filtration but it can be purchased separately. 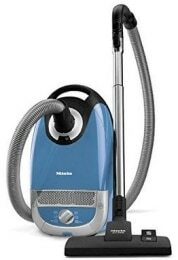 This is definitely a quality vacuum from Miele suitable for cleaning all types of hard floors. This cleaner comes with 2 different floor tools: Miele SBD285-3 Combo Floor Tool that is suitable for the hard floor as well as low pile carpet cleaning. The Miele SBB400-3 Parquet Twister XL Floor Brush gives a 16” wide cleaning path for better cleaning the hardwood and tile floors. Power with Miele’s 1200 watt motor, great power. 6 different speed rotary dial controls for cleaning different types of floors. Miele AirClean filter (can be replaced with HEPA filter) and Pre-motor filter. A button on the vacuum heads to switch between carpet and hardwoods cleaning. A long 33ft power cord with auto rewind capability. Three non-marking wheels to prevent any scratches on hardwood floors. Three onboard tools including crevice tool, upholstery tool and dust brush (store on top of the canister). 7 year warranty (motor and casing) and 1 year warranty for parts. 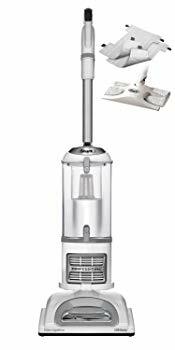 Click here to check out the latest price of this vacuum at Amazon.com. Note: Miele canister cleaners are not cheap, but this model is definitely one of the cheaper units available in the market. Remember, Miele vacuums have a 20-year average life-span so you can trust the brand. This is another reliable vacuum that is selling pretty well in the market for a long time, and it’s suitable for hard floors cleaning with less carpet. With the extension wand and fingertips controls on the handle, you can reach many places at home. Read the comprehensive review here. Power – 12 amps motor. Lightweight – less than 9 lbs weight let you easily carry around including stairs. Blower port – blow debris from the garage with ease. 2 setting height adjustments for cleaning bare floors and area rugs. 20 ft power cord to extend the cleaning reach. Accessories including the crevice tool, upholstery and dusting tool. A list price of over $100, but it can be found for less on Amazon.com. This Bissell canister vac is bagless, and it’s suitable for various types of surface including bare floors, low-pile carpets, and hard floors. This quiet vacuum comes with metal telescoping wand let you clean tight areas and under furniture’s easier. You can read the unbias review of this cleaner here. Motor power – 9.2 amps. Multi-cyclonic technology for longer yet powerful suction power. Multi-level filtration system to capture the most allergens. Dirt Cup Capacity: 2L with easy to empty dirt cup. 18 ft power cord with auto cord rewind feature. For more info, review, and rating of this Bissell canister model, visit this page. Side note: Just to let you know that the older Bissell Hard Floor Expert Deluxe Canister Vacuum, 1161 is another great hardwood floors cleaner. Other than canister vacuums, we also found that the traditional upright vacuum, as well as some small vacuums, also can deliver a great hard floors cleaning job. This consideration is mostly a preferential thing, as they both have their strengths and weaknesses. 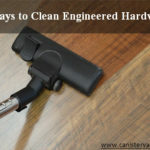 A canister vacuum can more easily get down under furniture and even performs better on stairs, as well as being a lightweight option. Full-sized uprights are usually heavier but also have a lot of power to them. There is also the option of a stick vacuum, which is a lightweight option for those who prefer the upright but want the versatility of a canister. Nowadays, some models have both a mop and sweep feature that can both sweep up your floor and mop it right after. This can turn cleaning that is usually a long, two-step process into one easy process. Some even have drying features that make sure no puddles are left behind. These lefts behind puddles can warp and otherwise damage your wood flooring. Anyway, besides canister vacuums, following are some other hard floors vacuums that are worth to take a look. This Shark Navigator vacuum is a truly powerful 2-in-1 upright cleaner (for regular floors cleaning) with a detachable canister to clean any places that seem to be hard to reach like the ceiling, curtains, stairs or every corner of your home. Lasting suction, fresh air, and superior all-floor cleaning will have you absolutely floored. Lightweight with swivel steering, the Anti-allergen complete seal and HEPA filter system that able to traps 99.9% of dust and allergens make this cleaning machine truly freshens up the air. The large dust cup capacity added with 30” long power cord can save your time for cleaning. The included accessories like Hard floor Hero, Pet Power Brush, dusting brush and crevice tool, plus washable microfiber pads can make your cleaning jobs easier while home look truly shine. Also, a 5-year warranty turns your purchase into risk-free. Shop Shark Navigator Lift-Away Professional NV356E on Amazon. The Hoover Linx cordless stick vacuum cleaner delivers you the convenience of a Hoover that is cordless and bagless together with power and performance you get from this cleaner. This particular stick vacuum is the first of its kind to feature the unique Windtunnel technology. This makes use of three suction tunnels in order to lift and then eradicate any hidden dirt completely. You can easily switch between cleaning on carpets and bare floor surfaces with the help of a brush roll that can be activated with one touch of a button. With the 18 volt Lithium battery, it will retain power until it is completely drained. In fact, this is one of the best seller stick vacuum models in the market for a long time. So it’s truly worth to take a look. Click here for more info and check the latest price on Amazon.com. This is a 2-in-1 lightweight vacuum (less than 10 lbs) that can be used for bare floors cleaning and it also can be easily converted to a hand vacuum for above floors cleaning. The wall mount storage hook can help you store the machine off the floor. 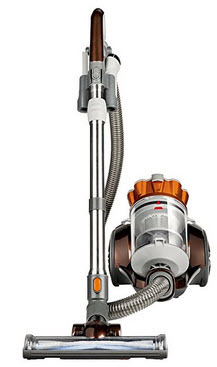 The Shark Rocket ultralight vacuum is powered by the latest DuoClean technology, which is a dual-brushroll system for triple particle cleaning (including small, large and stuck-on particles). You can use it to clean all types of floors including hard floors and carpets. The LED lights on the nozzle and handheld vacuum can help you spot the hidden debris especially while cleaning in less lighting areas. The long 30ft cord, duster crevice tool plus the pet multi-tool can help you in cleaning including the embedded pet hair with ease. For more instructions, you can watch the videos on Shark webpage. Shop the Shark DuoClean Rocket Corded Upright Vacuum (HV382) at Amazon. These vacuums are the best vacuum for hardwood floors because they are both powerful and strong. You will love the results from using this type of vacuum cleaner, and you will especially love the spotless clean that was once unachievable with the more archaic means of cleaning. Most hardwood vacuums can be used on multiple surfaces, making them a great item to have in your home. Also because they are lightweight, you can easily pull them out whenever you have a small mess to clean up and do not want to pull out the heavy vacuum to use. You absolutely want to preserve the life of your beautiful hardwood floor, which is an elegant feature to show off in your home. Hardwood floors are the best for families who have people in their homes with allergies as carpets can easily allow dust and other allergens hide deep within their fibers. Hardwood floors are becoming an increasingly popular choice in their homes because of these health benefits. If you have bare floor surfaces, these types of vacuums are important to help extend the life of your floors by allowing you to clean these delicate surfaces without damaging them safely. This makes it a worthwhile investment in your home, especially when you consider the costs of fixing your wood floors after damaging them with using the wrong type of vacuum cleaner. You will be thankful when including this piece of equipment in your home once you realize that these powerful machines are more than just useful on hardwood floors. Hardwood flooring is a very important part of your house, and it needs proper care to keep it pristine and beautiful. Choosing a reliable vacuum is essential to making it happen. Keep in mind of the things mentioned in this article can ensure that you get the best one that suits your flooring. You should go online and have a look and read the customer reviews of a particular vacuum model before you buy it. If you are still undecided or want me to choose, and considering all the factors then the Shark Navigator Lift-Away Professional NV356E will be the winner as the best hardwood vacuum cleaner. However, if you are looking for best canister vacuum for hardwood floors, then the Miele Complete C2 Hard Floor Canister Vacuum Cleaner is definitely great for this purpose. How to Clean Engineered Hardwood Floors Elegantly? How to Deep Clean Old Hardwood Floors?